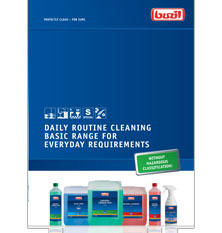 The compact and comprehensive Buzil range for highly effi cient daily routine cleaning has recently been summarised in a product overview. None of the products require labelling under the CLP regulation. The printed edition is available from your Buzil specialist adviser, or from Buzil customer service, and here it can be accessed in digital format.